It's strange to blog and blog and not discuss my Etsy shops more. I don't want to be one big advertising blog or anything, but it's my real life. I mean, this is what I do, all day, every day - for the most post. Even when I'm travelling, I'm at flea markets and swap meets, digging through junk to find bits of treasure. I spend my days conversing with customers, researching and cleaning my vintage finds, photographing them, listing them in one of my shops, packaging sales and going to the post office (I am there almost every day) so it seems I should be blogging about it more often. I am at estate sales several days a week and the auction most weekends. Two of the spare bedrooms in my home are solely devoted to my Etsy shops. They always say - write what you know! I'm going to try and get back to it a little more often. 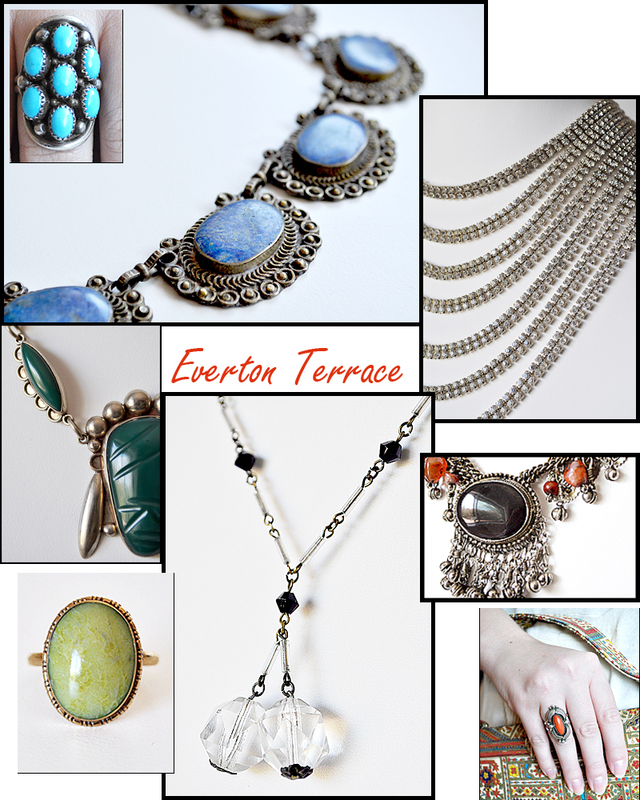 A little peek into some great finds in my jewelry shop Everton Terrace. Prices in this shop range from $8 to $210.00 so there is a little something for everyone. The average price is in the $20-30 range. 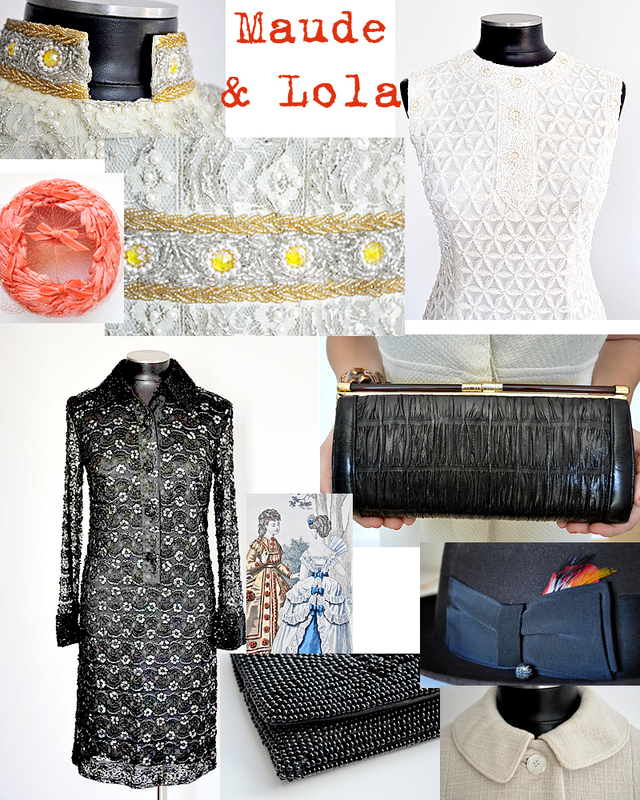 and here's a quick look at my other vintage shop Maude & Lola. Prices in this shop range from $10 to $2,266 and everywhere in between. I bet you are wondering what the expensive item is aren't you? The average price is in the $20 range. Those beaded dresses are simply gorgeous - how I wish they fit me (and I had somewhere to wear them). I've got some great vintage summer dresses waiting to be photographed as well - next month I think. Remember blog readers get a 10% discount in both shops with the coupon code BLOGREWARD10. There is still one more day left to enter the chocolate giveaway - winner announced tomorrow! Oh Jeanette - I didn't know about your vintage Etsy shop - will have to stop by!! I'm glad you're writing about etsy! The shops are a huge part of your life! Oh my goodness, so much beauty and that light green ring totally stole my heart! Kisses, darling. I love the treasures in your Etsy shops! You are doing such a great job with the 'hunting/gathering', cleaning, researching and photographing your finds! ok...I can no longer resist the tribal fringe necklace that I have had my eye on for a bit! Sold! I like when you blog about your shops or the places you have gone to find your treasure. I follow a blog were the artist post quite a bit about art she is doing for fun or her shops. So as this is part (big) part of your life... I vote, are we voting ? go for it. Who knew you were the Hunter/Gatherer type - LOL. Just kidding - your shops are awesome! So glad that redirected our attention to your stores Jeanette - what a treasure trove! That Knox fedora with the feathers - swoony. as well as your business? sound like a lot of fun! You should definitely post more about this! Oh my goodness I want to see more on your blog! That turquoise ring is divine! I'm so glad you mentioned this--I didn't know about your shop but am going to take a look--know you have fabulous taste!